Rickenbacker International Corporation announces the acceptance of orders for the Chris Squire Limited Edition. 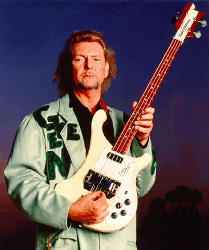 Squire is best known for his work with the supergroup YES which has been the recipient of a Grammy Award and numerous platinum and gold records. Squire has been considered for many years to be the quintessential rock bass player. Rickenbacker teamed up with Squire to replicate and improve upon his legendary "Rick" bass which he has used to make great music with over the last 30 years. By including the custom modifications requested by Squire, this instrument will be produced with unique features never before offered on a Rickenbacker bass. The Chris Squire Limited Edition, Model 4001CS, features neck through body construction using solid Eastern Rock Maple, a contoured body, dot inlays, precision tuning keys and Rickenbacker's famous tailpiece/bridge. The neck has been shaped to meet Squire's specifications and match his original bass. The head stock and fingerboard are sculpted from the same piece of solid Vermilion to insure consistency in grain and wood tone. The limited edition is finished in a special cream lacquer to match the custom color Squire commissioned on his own bass from an English luthier in the early 1970's. The Company has never offered this color before. A Rickenbacker vintage case is included with each instrument. The model will be formally introduced at the 1991 Winter NAMM Show in Anaheim. The Company will manufacture only 1000 of these instruments. Each bass will be accompanied by an individually numbered Certificate of Authenticity and Origin. Production deliveries and certificate numbers will follow order sequence. The suggested list price is US$1899, which includes a hard-shell vintage reissue case.